New season, the taste of summer! Trays of golden Kensington Pride mangoes arrived from the sunny Northern Territory! These new season, ready-to-eat Kensington Pride Mangoes are the taste of summer. They have a firm texture and are not stringy. Also known as the KP or Bowen mango, these are Australia's most popular mango! Born into a family of entrepreneurial spirits, Johan Bülow always knew, that he wanted to create something special. He threw his passion and attention into liquorice – a Scandinavian favorite that he felt was underappreciated and deserved to be taken seriously. He put in the hours and learned the craft the hard way, and by 2007 he was ready to cook, roll and cut his very first product. On 07.07.07 the first Lakrids by Johan Bülow shop opened in Svaneke. The idea was to cook the liquorice in the shop, making sure that you could smell it in a radius of 100 meters. It worked. Everything was sold out within two hours. The last customer even bought the sample bowl on the counter. Healthy snacking without the guilt! BarkThins are a Fair Trade, Non-GMO healthier snack option for the chocolate lovers! They never compromise on taste their commitment to sourcing the best ingredients possible to create a delicious snack that allows people to feel better about indulging in something they love. We are stocking a wide variety of flavours which include Dark Chocolate Almond, Dark Chocolate Pretzel with Sea Salt, Dark Chocolate Coconut, Dark Chocolate Mint and Dark Chocolate Pumpkin Seed! Join us in the Loft for complimentary tasting. The Australian craft gin scene has exploded in recent years but Four Pillars are still leading the way, producing some of the most exciting gins on the market. Their gins are fantastic and this rare opportunity for such an intimate tasting is not to be missed. Gin & tonic on arrival. $30 per person - only 20 spots available! Tickets available here. Established in 1975, the wines of Jasper Hill have long been synonymous with premium wines in the upper level of Australian winemaking. Well established and highly respected, Jasper Hill is a producer that set’s a benchmark for the region of Heathcote. Join winemaker Emily Laughton for an intimate tasting of the wine of Jasper Hill, one of Australia’s premier wineries for quality boutique wines. There's nothing quite like the taste of fresh-picked raspberries! We are now at the height of the season and they are rich in colour, a perfect balance between sweet and tart. They are full of antioxidants, vitamins and minerals. Try this decadent White Chocolate and Raspberry Trifle Cake by Donna Hay. Trust the Italians to dream up the perfect biscuit to go with coffee! Simply Amazing Biscotti are hand-made right here in Perth, using only the best ingredients. Biscotti actually means a biscuit twice cooked or baked. This gives it that crunchiness that goes well with coffee. It might be the sophisticated cookie by Italians standards but perfectly dunkable! Now available in our grocery department! No preservatives, no brine, hand made in small batches, supporting local farmers! You don't get much better than that! Molives is based in Sydney and are dedicated to crafting a variety of perfect gourmet olives which are unprecedented for their distinctive taste and freshness. The dream of Founder Mo Amin was to create olives that are truly tasty, fresh and healthy, and at the same time connect local farmers with olive-loving consumers over the world. Now available in our grocery department! Broad beans offer one of spring's best seasonal flavours! Our Broad Bean pods are firm and crisp. They're a great source of protein and carbohydrates, as well as vitamins A, B1 and B2. In the US, they're known as fava beans. For wonder recipie ideas visit BBC's Good Food guide on "what to do with broad beans". Cathy and Neil Howard have been making wine for most of their lives. They are incredibly passionate about nurturing their vineyards in order to handcraft the highest quality wines. Cathy joins us this Friday to taste through the range. Entertain friends and family this AFL Grand Final weekend with our 100% pure Wagyu Beef Burger. Our skilled butchers hand make these burger patties fresh every morning. We use only pure Australian Wagyu Beef and a mixture of our own herbs and spices. 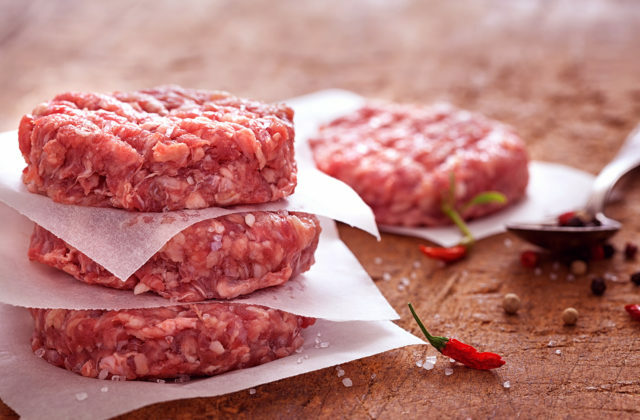 These burger patties are juicy, rich and perfect for the barbecue! Tues, 2 October from 5 pm to 7 pm! Join us this Tuesday for a tasting with Punt Road and Airlie Bank winemaker Tim Shand. Tim heads a dynamic, progressive young winemaking team at this James Halliday five star-rated winery. Punt Road is a standard-bearer for wines of character, drinkability and a clear, proud Yarra Valley stamp. All of his wines are incredibly easy drinking and great value for money. Il Gelato take pride in the realisation of their dream to introduce to the Australian market, world class gelato, made in small batch freezers, following the same artisan process used by Italian gelaterie. Savour an Italian moment and get your fix today. We are now stocking an extensive range of flavours in are Market! Il gelato strives to make the highest quality product, made fresh daily, sourcing the best produce on offer. We are joined by special guest Tracy Mann for an in depth look at Rosé Champagne. Learn about methods of elaboration and how to assess Rosé Champagne, discover the versatility and gastronomic qualities of this beautiful champagne style, and review some of the differences between the Grand Maison and small domain grower styles of Rosé. Tracy is one of Australia's most experienced Champagne educators and consultants, endorsed by the Champagne Bureau Australia. In 2016 she achieved Honours in the Champagne Master-Level Exam held by The Wine Scholar Guild. In 1996 she was the winner of the Vin de Champagne Award and in 2003 was inducted into the Ordre des Coteaux de Champagne. Tracy is a recognised ambassador for the region of Champagne. Papaya is an incredibly healthy tropical fruit, loaded with antioxidants that can reduce inflammation. Our Papaya is locally grown right here in WA, it is sweet and delicious! For recipe ideas on how to use this delicious, summer fruit head here. Morel papayas are now available in our produce section.